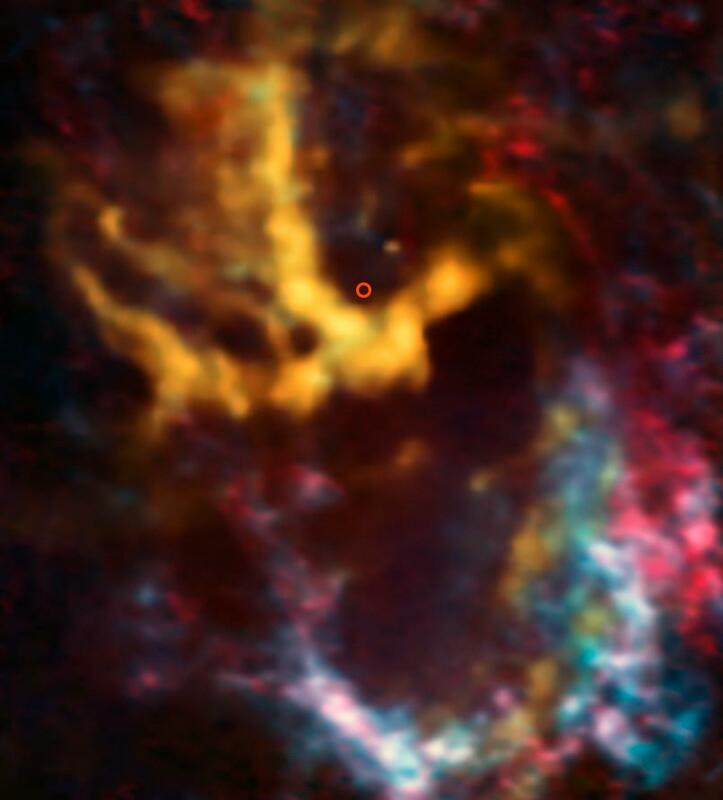 This image from the ESO’s ALMA Observatory shows the area surrounding Sagittarius A*, the supermassive black hole that lurks at the center of the Milky Way — highlighted here with a small circle. New research has revealed exciting evidence of interstellar gas and dust orbiting the black hole at high speeds. 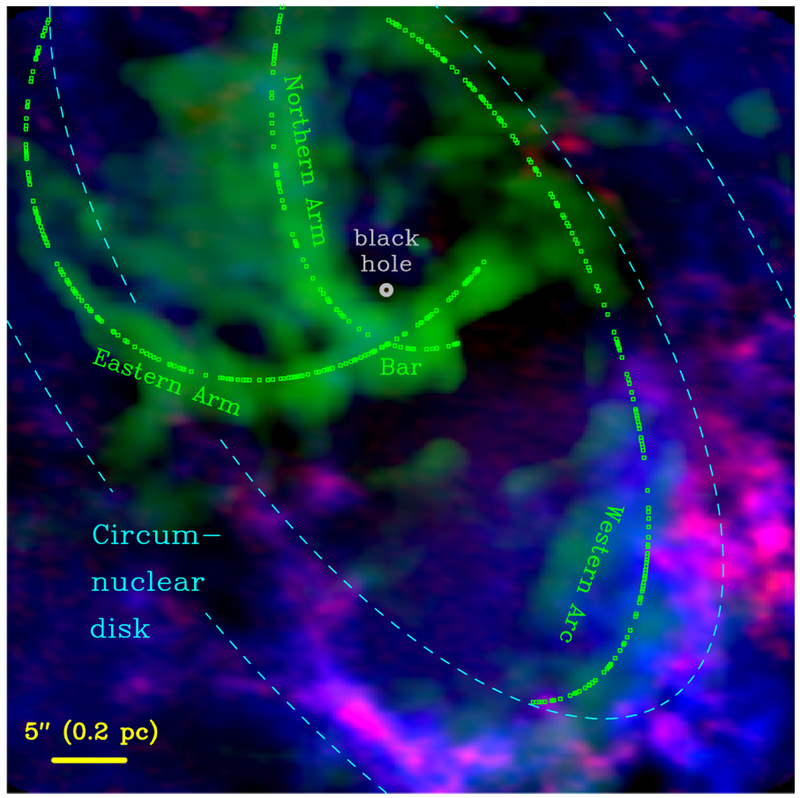 The molecular-hydrogen-rich gas clouds which have been identified are known as molecular cloudlets, and they have never before been unambiguously detected. This image actually shows the distribution of molecules including carbon monoxide, the cloudlets’ second most abundant molecular component. The cloudlets lie 26 000 light- years away from us, orbiting fast and relatively close to the black hole, at a distance of about one light year. ALMA’s high resolution allowed scientists to detect the cloudlets, which are the products of pre-existing massive clouds rotating around the center of our galaxy. These clouds were tidally disrupted into dense fragments and a lower density, short-lived component. The latter was identified thanks to the signs left by the passage of the synchrotron radiation emitted by Sagittarius A* through diffuse gas between the cloudlets. This ALMA image shows the central 2 parsecs of the Milky Way, with Sag. A* circled in the middle. Blue represents carbon monoxide and red represent hydrogen cyanide. The dotted blue and lines represent inner and outer circular orbits around the black hole. The dotted green lines represent elliptical orbits previously proposed to fit the motion of the ionized gas streamers. The motions of the CO and HCN cloudlets follow neither orbit. Image: Atacama Large Millimeter Array Observatory, Goicoechea et. al. 2019. Last week, we reported that physicist George Chapline thinks that Sagittarius A* is more than quiet: Chapline predicts that we’ll find that it does not exist. This December, at the Kavli Institute for Theoretical Physics in Santa Barbara, Chapline, at the Lawrence Berkeley National Laboratory, expects to have his prediction that black holes don’t exist tested with the release of findings by the Event Horizon Telescope—really a virtual telescope with an effective diameter of the Earth—that has been pointing at the Milky Way’s central supermassive black hole for the last several years. Most of the astrophysics community, reports Jesse Stone at Nautil.us, expect that images of Sagittarius A* taken from telescopes all over the Earth, will show the telltale signs of a black hole: a bright swirl of light, produced by a disc of gases trapped in the black hole’s orbit, surrounding a black shadow at the center—the event horizon. This encloses the region of space where the black-hole singularity’s gravitational pull is too strong for light to escape.